An optical pathway, called a waveguide, is connected to an opto-mechanical resonator that looks like a pedestal. Electrons carry information over tiny distances in computer circuitry. Photons are commonly used to carry information over kilometer distances. Scientists are currently developing micron-scale optical devices to replace and/or be compatible with electron-based circuit elements. Diodes are one-way streets for current, blocking backwards-moving electrons from passage. In optics, one-way travel for photons is typically created by using what’s known as Faraday rotation. Here, a large magnetic field interacts with a crystal such that light waves passing through the material get their polarization rotated. Scaling down this device to fit onto microelectronic chips is challenging due to the sizable magnetic field and difficulty integrating the magneto-optic crystals onto chips. 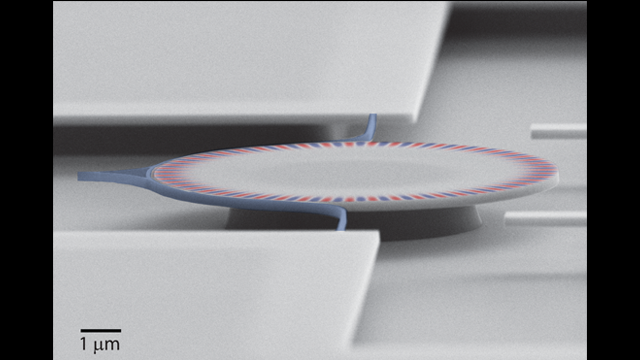 PFC-supported researchers propose using ring resonators to construct a micro-optical diode. The technology is silicon-on-insulator, making it compatible with the fabrication processes underlying today’s computer circuits. To force the photons to travel one-way, the researchers propose to inject intense light (called a “pump”) into one of the resonator pathways (here the clockwise path). The pump light enhances the clockwise-moving light’s influence on the breathing. Now the vibrations are strong enough that the light is modulated. The result is that, at certain wavelengths, the clockwise light (light from the left) will transmit through the waveguide. However, light that travels counterclockwise does not excite vibrations and is still absorbed or blocked by the resonator. This is an optical diode. This system has an advantage in that this optical isolator can also work with single photons, in the quantum limit. Additionally, researchers potentially can use an array of these micro-resonator diodes for simulating quantum many-body systems.